The NFL are planning to build a new field at Triangle Park in Dayton, where the first game was played. The Cincinnati Bengals to practice at the park later this summer. 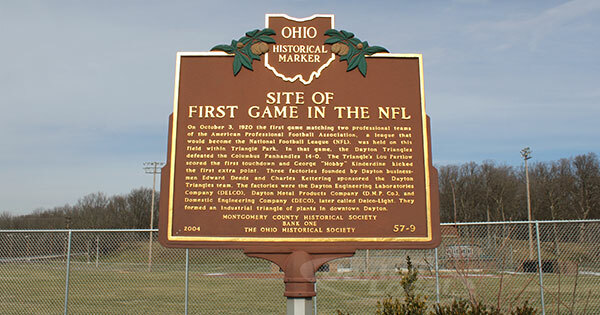 The NFL Foundation has announced plans to honor eight "original towns" outside the current NFL market that were home to teams in its inaugural season, including Dayton, Ohio. If you didn't already know, Triangle Park was the site of the first game in the NFL, which took place on Oct. 3, 1920, between the Dayton Triangles and the Columbus Panhandles. The Dayton Triangles won 14-0. "This is a really special moment for our city," said Nan Whaley, Mayor of Dayton, Ohio. "We’re excited that the NFL is recognizing the places that were there in the very beginning and that they are celebrating Dayton’s special history in paving the way for the league with a donation that will leave a lasting impact in the community." The NFL Foundation will pay to install a new artificial turf field at the park and make donations in support of local youth football programs. The Cincinnati Bengals have announced it will practice at Triangle Park later this summer. "We’ve enjoyed going up to Dayton to practice in the past and we look forward to this visit that is such a special one for us and the league," said Bengals executive vice president Katie Blackburn.